Asher Yatzar is a way to thank the Crea-tor for the Proper Functioning of the Body. One who recites it regularly may be able to achieve Healing. 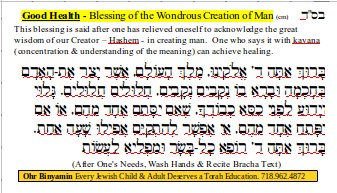 Asher Yatzar – Wondrous Creation of Man Blessing (for Good Health). Prayer recited after washing hands after one's needs. This is a segula for good health. Asher Yatzar is a way to thank the Crea-tor for the Proper Functioning of the Body. One who recites it regularly may be able to achieve Healing.